These burgers are made from my eggplant dip recipe. That’s right: burgers that start off as dip. The veggies get thrown in the oven to get tender and caramelized. You get a HUGE amount of smoky savoriness whenever you roast something, and since I love that flavor, I do it all the time. The combo of slightly charred red pepper and onions mixed with soft, protein packed eggplant is absolutely mouth watering. There’s a hint of basil and garlic that tastes great but smells even more amazing. When everything is all roasty toasty, mash it, and add a dash of soy sauce for another layer of flavor. To give the burgers some body, I mix quinoa in with the eggplant. You’re going to be amazed what that little grain does to the eggplant spread…it bulks it up while also packing in an insane amount of nutrition. When everything is combined, shape them into patties, cook stove top, add a slice of cheese, toss on a delicious bun, and take a bite! Oh yeah, add some arugula too. Don’t skip it (my mom tried to sneak it off her plate!). 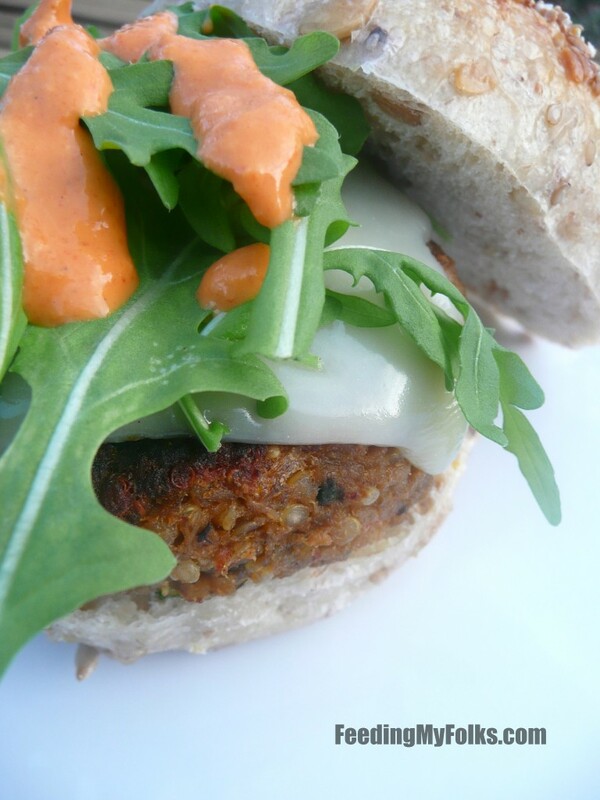 Not only can you never have enough vegetables, but the arugula gives a light peppery flavor to each bite. So freakin’ good! The fresh greens are also a great contrast to the roasted flavor of the burger. Before you dig in, drizzle with your favorite condiment. I really love the red pepper ranch sauce from this post, but feel free to experiment! 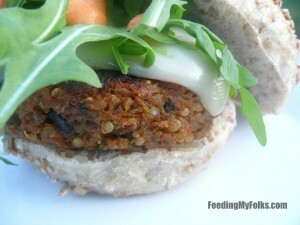 I mean it when I say that even carnivores will go head over heels for these eggplant burgers. Preheat oven to 400 degrees Fahrenheit. Lay chopped veggies onto a large baking sheet. Sprinkle with salt/pepper/red pepper flakes, drizzle with a little extra virgin olive oil. Toss so everything is coated. Bake for 30-35 minutes, or until vegetables are tender (flipping once midway). Remove from oven and mash/blend the vegetables with the basil and oregano in a large bowl. Mix in the cooked quinoa, soy sauce, egg, and bread crumbs with another pinch of salt/pepper. Form into patties. Put a nonstick skillet over medium heat with 1 tablespoon of oil. Cook patties 2-2.5 minutes per side. 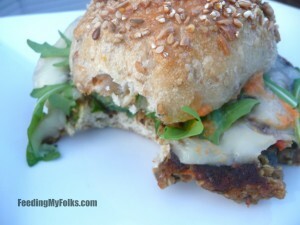 Put the cooked patty on a sliced roll, top with cheese, arugula, and condiments. I love the creative way you put together that burger! 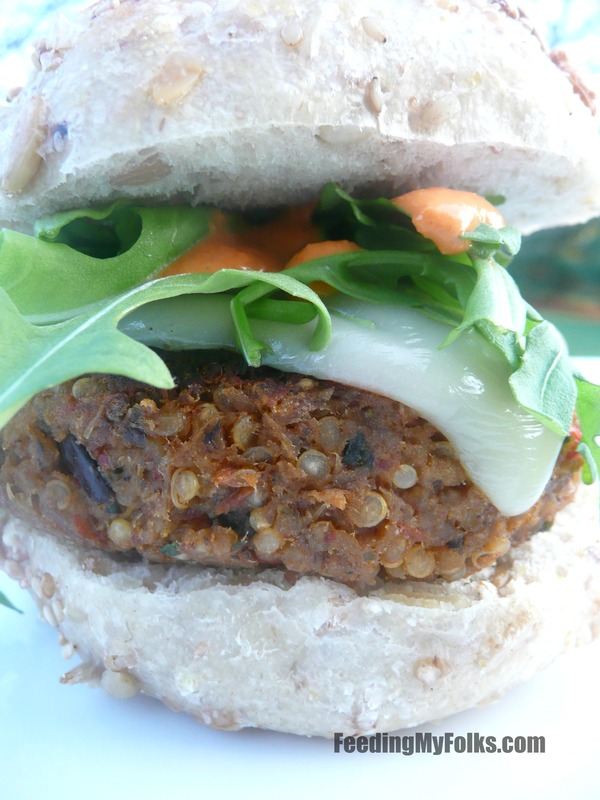 I never would have imagined adding quinoa to make a patty. I’m still not the biggest eggplant fan but now I really want to try making that red pepper ranch sauce. Yum! These burgers are delicious and nutritious, Jen! The sauce compliments the burgers very nicely…you should definitely try it out.